My old Compaq desktop recently decided that Microsoft Vista was no longer welcome. I mean, Vista just wouldn’t boot. Linux booted fine, but no amount of reinstalls, tweaks, etc. would get Vista going. I needed Vista only for the purpose of running a Microsoft Access database. So, I decided that this was as good of an excuse as I was going to get for buying myself a decent laptop. I thought I would try to get something with Intel based cpu and graphics, since everything I currently used had older Nvidia graphics, and AMD processors. I just wanted to see how Linux and Intel get along. I should have studied up on things a bit more before buying! Antix 12: monitor backlight worked, but wireless network wouldn’t. Chakra 2012.12 64 bit: don’t remember for sure, but I think the monitor worked, but the wireless didn’t. Linking in Linux: a real timesaver! I recently discovered a Linux feature that had escaped my notice for nearly a decade: the use of links. While installing a new OS (Bodhi 1.2, I think it was), I was wishing for a way to keep my data safe on a separate partition while still having easy access to it from within my new installation. I knew there must be a way. I decided to play around with linking. First I learned the hard way. For example, if I wanted my new OS to link to my .mozilla profile on the data partition, I would first remove the new OS’s /home/les/.mozilla file, (rm /home/les/.mozilla), and then create the link like this: ln -s /home/les/.mozilla /path-to-my-existing-.mozilla-profile. When I did this, to my utter amazement, Firefox opened up on my brand new OS with all my bookmarks, history, personas, etc.! Next I tried the same with /home/les/.thunderbird, and guess what… it brought in all my mail, account setups, etc. Now I was excited! I navigate the left pane to my new OS’s /home/username folder. I navigate the right pane to my /home/username folder on the partition that contains my data. Then on the left pane I delete the empty folders that I won’t be needing, for example, Documents. 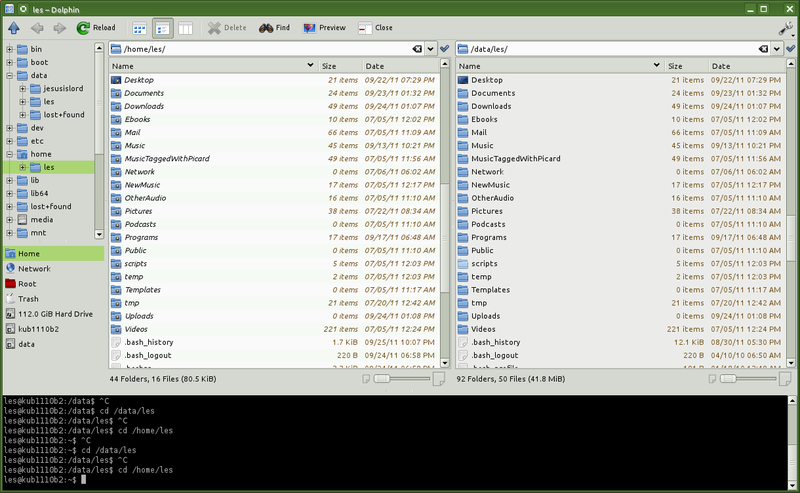 Then in the right pane, I select the Documents folder and drag it to the left pane. I am then given the options “Move here/Copy here/Link here.” I select “Link here,” and it creates a link to the Documents folder on my Data partition! No more waiting while thousands of documents are copied to the new OS! This has worked like a charm, and even though it exposes the lack of depth in my Linux geekiness, I just had to share it. 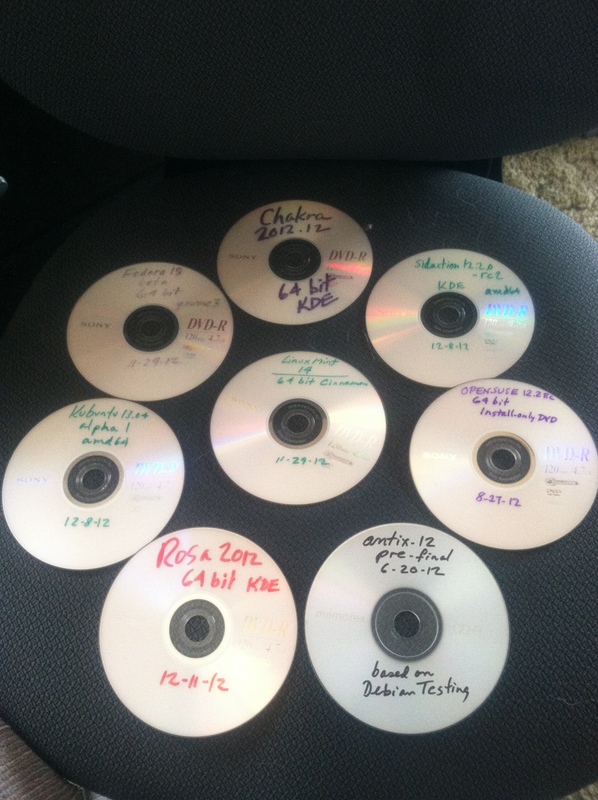 Perhaps someone else will be spared the multiple hours of copying files that I have wasted in the last decade! After some things were a little funny in Kubuntu 10.04, (like log out and shutdown buttons not working… I have a low tolerance for stupid little frustrations…) I got Mint 9 KDE version installed, and it is running beautifully. The WOW is for the way it automatically found and setup my HP Photosmart Premium printer as soon as I turned it on. No hunting for drivers, no messing with CUPS… it just automatically configured it and it works! Then I was able to reboot, update through Synaptic, and it configured the new kernel, updated grub.cfg, etc. without a hiccup. 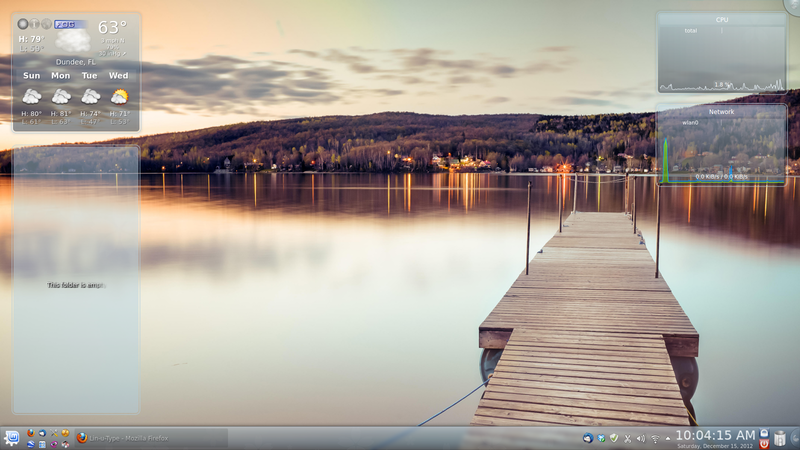 I have taken a long and winding road since my last post, but have landed (for now) with Kubuntu 9.10. I had worked through the pain of setting up Arch Linux with KDEmod repositories and all, but could not seem to get past a dysfunctional Akonadi server, which would pester me every time I wanted to open Kmail or Korganizer or Kontact. 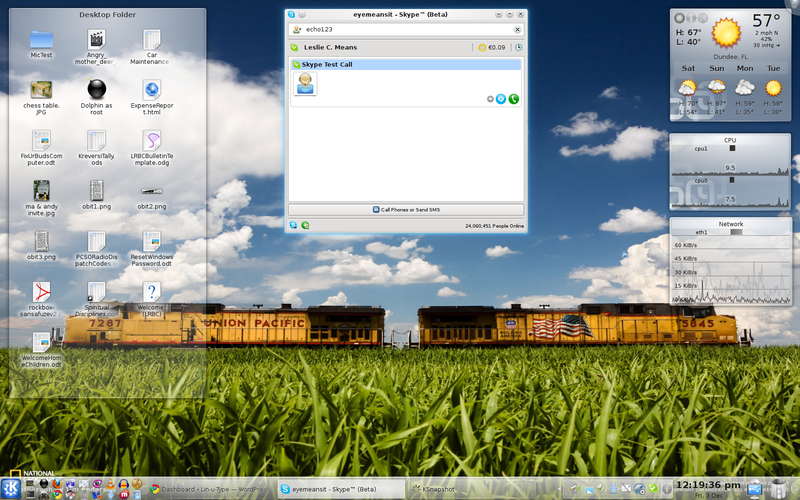 So now, all is working very nicely with Kubuntu Karmic. I did have an issue with installation… the live CD installation would stop every time with “scanning disks” at 47%, and simply would not proceed. I got around that by downloading the Alternate Install CD. Sabayon 4.2 is a very beautiful Linux distribution, which is what attracted me to give it a try. Additionally, their packages are pretty close to the bleeding edge, which is what I generally prefer. Once I had it set up, I was quite happy with it, except for one thing… it is Gentoo based. I simply can’t get my head wrapped around the package management terminology and procedures, being so accustomed to apt-get and Synaptic with most of the Debian based distros I have used. After several weeks of “wrassling” with it, I managed yesterday to bork the installation by allowing it to do a kernel update without doing the proper nvidia update that goes along with it. When I rebooted, it just gave me the black screen and a blinking white cursor in the top left corner. I did manage to figure my way out of that dilemma for a little while. (Ctrl-Alt-F1 got me to a terminal session, where I could login with my username and password, and use equo to install the nvidia driver). However, once back on the desktop, I made the mistake of saying yes when the “equo update && equo world –ask” command wanted to clean up “unneeded” packages. Basically it removed practically all of KDE, and rebooting left the machine in an unusable, unfixable (by me) state. Oh well. Back to Mint 7 again.